Tired of changing your carport cover every year? 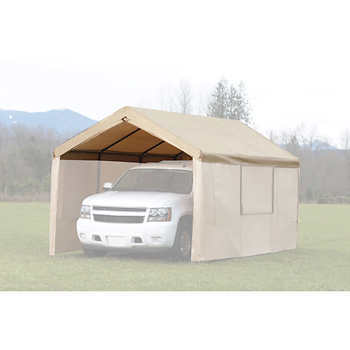 Try our super heavy duty replacement carport covers. Custom made of 18 ounce vinyl in your choice of color. Do you have a dark brown Costco frame purchased in the last 10 years? We have the COSTCO REPLACEMENT CARPORT TOPS, SIDES AND ENDS to fit it. Does your frame measure 11′ OVER the peak? See our measurement guide on the home page. If it does, your frame takes very specific front and end panels. We have them. They are in high demand so we do not list them on our website. Please call to place an order for these original side and end wall panels: 541-951-2861. This frame is different than the older frames Costco, Bi-mart, K-Mart etc. sell and sold as it is a foot shorter over the peak than most frames. Therefore, standard replacement covers will be too large. We sell the tops, zippered front and end panels and the original side panels while supplies last. Please call 541-951-2861 to place your order.